As Independent booksellers look to gain traction in the pre-order market, many of us are actively engaged in understanding its nature. Successful pre-order campaigns, like many of life’s other notable missions, involve a complex of factors working together effectively. These factors include early discovery, established customer buying patterns, in-store and online marketing done in conjunction with publisher marketing efforts and the carrot of desirable swag. The ABA put together a pre-order task force recently which I participated in. 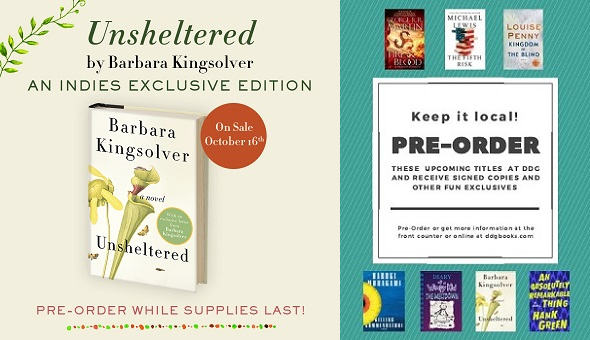 Seven titles with fall release dates were chosen for our promotions and we all looked to explore the means to grow our individual store’s presence in this key market. There is no question that the effort was a success. At DDG our pre-order numbers for these titles was much higher than they would have been without the outreach. What lessons smote my questing cerebral cortex? We did better with titles which did not have a long established online pre-order fanbase but were very much in our wheelhouse. Murakami’s Killing Commendatore, Kingsolver’s Unsheltered, Penny’s Kingdom of the Blind, and Kinney’s Wimpy Kid 13 did better for us than George R.R. Martin’s Fire and Storm, for example. We did social media posts, newsletter features and in-store posters and signage. They were all important, but the newsletter feature and the in-store presence translated directly to sales whereas the social media presence bolstered word of mouth. For example. We had one book which was easily the biggest success here and that was Killing Commendatore. A forensic analysis of that campaign should yield the answers we seek. Murakami is a store favorite author and we have built up a following here. Knopf did a great job producing graphics for use. Furthermore the author used his own email flash to reach out about the promotion. This led to the email below from a customer who received Murakami’s flash email. The strong publisher support, along with our own efforts both in the past and in the present, drew a strong response. 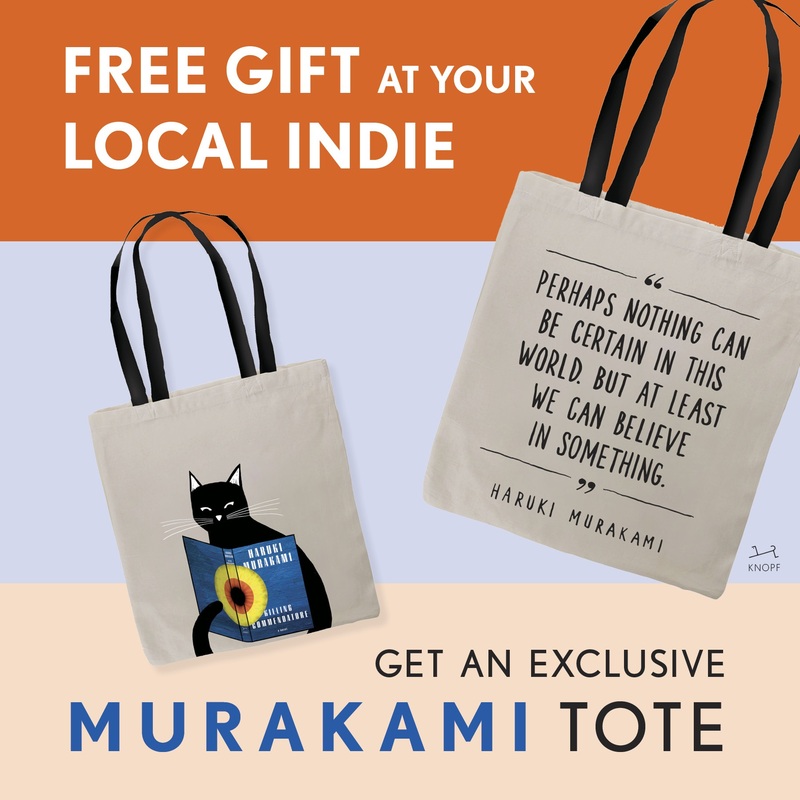 What sealed the deal however, was that the promotion was centered on a great swag item, a totally desirable Murakami tote bag. Our marketing was built around the idea of keeping your pre-orders local. And why wouldn’t our customers? They heard about it early, either from us, from the publisher, or the author, all referring to the indie campaign. They were signing on to grab a great tote bag and buy a great book from their local bookstore, the same place they’ll look toward for their next pre-order. The only downside? What if there is only one tote bag left for staff? Yes those are Lyric McKerrigan Secret Librarian capes. Thanks Alia and Ali! This entry was posted in Uncategorized on September 20, 2018 by Kenny Brechner. 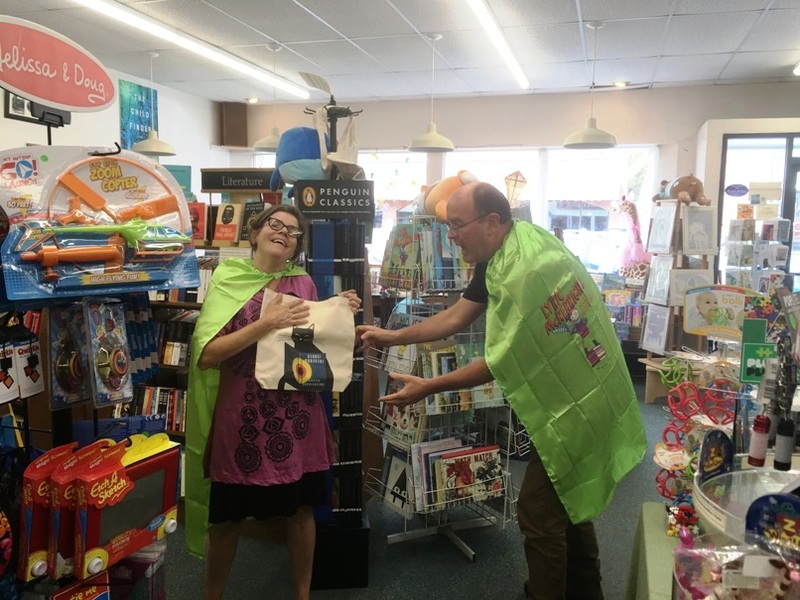 Kenny Brechner is the owner of DDG Booksellers in Farmington, Maine. Though a member of the ABA Board the opinions expressed here are strictly personal.